Shut down by the U.S. FAA, EASA-approved Internet-based flight-sharing is on the rise throughout Europe, but not without its own measure of controversy. While private pilots see it as a way to increase their flying budgets, some business aviation charter operators express skepticism. Ever since flight-sharing app Flytenow was closed by the U.S. FAA (legal appeals failed when the Supreme Court refused to address the case in January 2017), the continuation of flight-sharing apps and sites in Europe has been controversial. Leading the way has been Wingly, which has fought its corner with remarkable success as regulators have interpreted the EASA legislation that allows flight sharing in Europe. Some in the business aviation sector have been vocal about their concerns, including PrivateFly co-founder and CEO Adam Twiddell and Biggin Hill Airport’s Robert Walters. Safety oversight, pilot experience, and similarity to charter were central to these concerns. Pilots advertising flights is permitted, according to EASA and UK CAA interpretations, and this was later also supported by France’s DGAC, which initially put barriers in the way of online advertising of flights. Year-over-year growth in passenger flights has been approximately 200 percent, said de Waziers. In April 2017 there were 280 passenger flights and that grew to more than 800 last month. Overall, however, the period between January and March fell short of expectations due to unusually bad flying weather in Western Europe. “Globally, the picture is [looking] pretty good,” he concluded. “France and the UK are going nicely, growing faster than Germany now.” He said France emerged as a success story after regulators became satisfied that Wingly could ensure its members’ flights were not commercial and did not in any way make a profit. Having set up a working group on the issue, Wingly made certain undertakings on how it would operate and signed a charter with EASA. The agency originally created the rules that opened the door for a more liberal type of flight sharing by pilots, but perhaps did not appreciate that it would lead to controversy. The DGAC followed—“they approved the activity last June”—and subsequently Wingly was able to come to an arrangement with the French Federation of Aero Clubs (FFA) in October. “France has been a real breakthrough,” said de Waziers. “We’re really focused on those three countries,” he said. “We have a lot of flights happening throughout EASA-land. Norway, Italy, Iceland, Spain, Denmark, and so on.” He said the country only relates to where it has rolled the app out in the local language, but in theory it can be used anywhere in the region. "In the UK, we have started to have problems with some airfields. Elstree and Biggin Hill banned us because they didn’t realize there has been a regulatory change. We met with Biggin Hill and they want air-taxi aviation and they don’t want GA,” de Waziers said. (In fact, the airfield recently gave notice to its three resident flying clubs/schools, not wanting students doing circuits in an environment increasingly busy with business jets.) He is due to meet again with Elstree in June to see if this can be turned around. De Waziers does not relate Wingly flights to air-taxi flights as pilots are not making a profit, just offsetting the cost of a flight they would do anyway. He underlined other benefits, anecdotal evidence that some members of the public that fly with Wingly are going on to get pilot licenses. He said there have been two pilots in Germany who have done this recently, and two have been training in the UK (one passed his PPL in April). 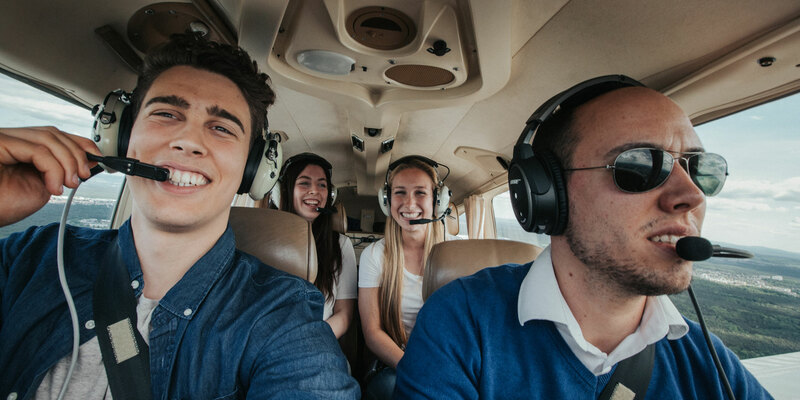 He added that Wingly has seen lots of repeat passengers, and some pilots even use it for friends and family who want to fly with them because Wingly offers an additional level of insurance. This covers the passenger up to a limit of €1 million even if the pilot makes a mistake, which means the pilot doesn’t have to worry about not having the proper insurance. De Waziers said, “The aim is to get as many users as possible. Our first focus is the European market. The U.S. market is really interesting," but for now advertising flight sharing on the Internet is not allowed there. The Baltic Air Charter Association (of which the likes of Privatefly are members) sees flight-sharing websites in a different light. BACA chairman Richard Mumford said BACA has concerns about flight sharing in general as it had manifested via the internet and apps, but he was careful not to single out Wingly. “There is a reason why there is a distinction between commercial and private flying and why commercial is subject to more rules and have AOCs," he said. “I understand the exception whereby if a pilot is taking some money for fuel, it is not commercial. But advertising a flight is different. “I don’t believe the traveling public understands the distinction. I’m not saying that pilots [that share for money] are bad pilots or that they maintain their aircraft badly, but there is a reason why our operators go through what they do.” Mumford said BACA members had “found it hard to get regulatory engagement” on the issue. He did not comment on websites inviting people to request flights, as Wingly also does. In response to criticism, de Waziers commented: “If people say they need to go from one place to another, then we say you should look at air taxi or charter commercially. What [Wingly pilots do] is more about leisure. “EASA and the CAA are happy as long as the pilot doesn’t make a profit. That is why we are developing a way we can check prices they charge relative to the aircraft used and the costs.” Otherwise, they need an air operator certificate or to be an air training organization, he agreed. De Waziers said Wingly is in touch with Flytenow’s former lawyers to monitor the situation in the U.S. Meanwhile, his team is working to integrate Wingly functionality into the Jeppesen Mobile FliteDeck app. In conclusion, de Waziers said “air-taxi companies really like [Wingly] and see it as something good. They’re a totally different market.” He said Stratajet founder Jonny Nicol has “tested Wingly” and had a long debrief telephone call with de Waziers. Nicol particularly found that young people were interested in using Wingly to experience flying, de Waziers said.